Animal Cruelty: Could a Barbaric Pig-Handling Video Hurt Major Grocery Chains? A photo released by an animal rights group shows at pig on a farm in Iowa. Earlier this year, the National Pork Board introduced its new slogan: "Be inspired." It isn't nearly as catchy as "the other white meat," an earlier campaign that touted the health benefits of pork, but it did evoke something even higher and nobler. But nobility hardly describes the public image of the industry this week, and if consumers are inspired to do anything at all, it would be to stop eating pork entirely. That's because of the release of a horrific undercover video shot by the advocacy group Mercy for Animals (MFA) that captures the allegedly brutal treatment of pigs in an Iowa factory farm. What's more, MFA has also linked this particular pork producer to four major U.S. food retailers  Kroger, Costco, Safeway and Hy-Vee  all of which sell or have sold the company's meat. If the video is legitimate  and there's nothing so far that credibly suggests it's not  there's no way to prettify or justify what it captures. Piglets are casually tossed across pens from one handler to another (one worker says pigs are "bouncy") and those that are considered sickly or nonviable are slammed head-first on the floor  a quick and efficient way to kill them. Animals are castrated and their tails are docked  or cut off  with no anesthetic. In crowded conditions pigs tend to bite one another's tails, and neutered males are generally less aggressive. Sows forced to breed repeatedly suffer fatal and painful uterine prolapses, with their reproductive organs sometimes spilling out of their bodies. Females are also confined in gestation crates, which allow them to lie down but provide them too little room even to turn around. Read "The Problem with Factory Farms." The MFA investigator who shot the video using a pinhole camera, and who spoke to TIME on condition of anonymity, applied for a job at the factory for the purposes of conducting the investigation, and worked there from mid-April to mid-June. The investigator admits to having engaged in some of the same brutal practices depicted in the video, explaining that that was part of the job and refusing to do the work would have resulted in dismissal before the investigation could be completed. Consumers watching the video can take little comfort from the idea that these are the doings of one bad company and that the meat produced there represents just an isolated part of the market. "These products are making their way all over the country," says Nathan Runkle, MFA's executive director. In other words, if you eat pork, these are the pigs that may be on your plate. The factory in which the abuse is allegedly taking place is known as Iowa Select Farms, ranked by Successful Farming magazine as the fourth-largest pork producer in the country. Iowa Select does not actually do any slaughtering itself. Those pigs that survive life on the factory floor are sent off to two slaughterhouses operated by JBS Swift; no allegations of brutality there are being made. In a statement on Tuesday, Iowa Select emphasized its "commitment to animal welfare." Howard Hill, the company's senior veterinarian and director of external affairs, told TIME, "We will pursue this investigation thoroughly, and we'll take any appropriate action that needs to be taken," adding that "company policy, which has been in place now for several years, is we have zero tolerance for any kind of animal abuse." According to Hill, and contrary to the word of the undercover investigator, the video "does not really depict what happens on our farms day to day. We have strict animal welfare policies and training of our employees, and these are small little snippets." Read "A Legal Assault on Animal-Abuse Whistle-Blowers?" The four retail chains that buy Iowa Select's meat have reacted with differing degrees of alacrity to the revelations. Safeway and Kroger have announced that they will stop doing business with the company while the matter is investigated further. Costco says it is also investigating, but thinks cutting off business with one particular farm in such a large industry would be ineffective. Hy-Vee says they're "following up with all of our suppliers to ... make sure that they're following the accepted industry standards for the treatment of animals used for food." To keep the pressure on the retailers, MFA is holding rolling press conferences today in Seattle, Des Moines, Cincinnati and San Francisco  the home cities of the four chains. Shoppers at any of the stores who want to make sure they are not buying Iowa Select meat can look at the product's packaging. If it contains a stamp that reads 3S or 3W, it came from the relevant JBS slaughterhouses. The problem is that Iowa Select pigs are not the only ones JBS processes and other factory farms may thus be punished too. Iowa Select's most disturbing defense might be Hill's remark to TIME that he doesn't believe that the video  even granting it's authentic  shows abuse, and he may be right (though he says pig-tossing isn't company policy). Nearly all of the practices shown in the video actually qualify as "standard practice" in the pork industry. And in Iowa, the largest pork-producing state in the nation, if it's standard, it's legal. Chapter 717A of the Iowa Code, titled "Injury to Livestock," includes an exemption for "customary animal husbandry practices." And the federal regulations that exist pertain only to farm animals that are in transit or moments away from being slaughtered. "We're really looking at standard agricultural practices here," says the MFA's Runkle, "and that's why we're going to the grocery chains who we feel have the power and responsibility to implement meaningful animal welfare policies." Reforms at the factory farm level are coming  but only slowly. 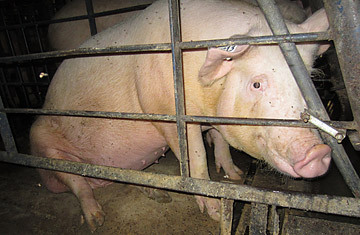 A 2008 Pew Commission report, "Putting Meat on the Table: Industrial Farm Animal Production in America," concluded that "the most intensive confinement systems, such as restrictive veal crates, hog gestation pens, restrictive farrowing [or pig-birthing] crates, and battery cages for poultry, all prevent the animal from a normal range of movement and constitute inhumane treatment." In the past few years, at least seven states have banned gestation crates. Safeway says, "We continue to pursue our goal of increasing the amount of pork from North American suppliers that are phasing out the use of gestation crates." As for anesthesia-free tail-docking and castration, Anna Johnson, a veterinarian brought in by Iowa Select to aid in their own internal investigation, says that no pain-killers have been approved for piglets undergoing castration. She emphasized that she would be visiting the facility in question, and could make better judgments about the conditions there at that time. The company does take issue with the throwing of the piglets, and while slamming sickly ones against the ground is also not company policy, Hill says it is "an approved method of euthanasia" in the industry. At the moment, Iowa Select seems at least as concerned with its corporate image as the welfare of the animals  not an uncommon first reaction for a company under fire. Hill, who is also on the board of the National Pork Producers Council (NPPC) and last year was named to U.S. Agriculture Secretary Tom Vilsack's Advisory Committee on Animal Health, told TIME, "We're always disappointed when we see something that reflects poorly on the industry." The NPPC is not yielding any ground yet either. Its website continues to state that it "opposes legislation that would mandate on-farm food-animal production practices." Some industry officials even oppose letting consumers see what those practices are. The Iowa state legislature has a bill on the table that would outlaw the production, possession and distribution of videos, pictures, and other "recordings" of farms taken without the owner's consent. Florida, Minnesota, and New York also introduced  but didn't pass  similar "ag-gag" bills this year. Of course, the ultimate power to change all of this comes not from industry, legislators or activist groups, but consumers themselves. When shoppers shut their wallets to anything  including animal cruelty  reforms happen fast. If things at Iowa Select are as bad as they seem, it may be a good time to skip the pork aisle, at least for a while. Read "Getting Real About the High Price of Cheap Food."